All leather and suede articles are made from natural animal skin which contain their own natural oil or lubricant which keeps the texture soft. All leather and suede articles are made from natural animal skin which contain their own natural oil or lubricant which keeps the texture soft. 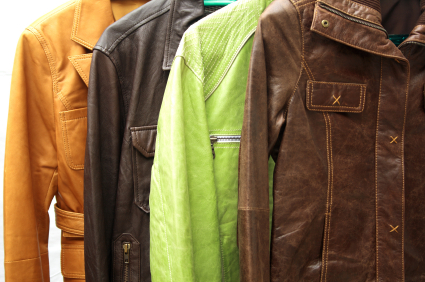 All leather and suede articles are dyed and are therefore never totally colour-fast. On most leather and suede articles, glue has been used on the cuffs, or on the hems of jackets, skirts etc. Shoulder pads and buttons are usually weakly stitched on. Stains are immediately absorbed into the skin and are difficult to remove without damaging the texture or dye. Protein stains (blood, milk, egg and chocolate) are the most damaging since they need an alkaline chemical to be removed, and this is extremely harsh on the skin. Paint and oil-based stains need a solvent to be removed, which in turn can remove the dye of the article. Manufacturers of leather goods usually use fillers to cover any scars on the leather. Sometimes dry-cleaning removes these fillers, some scars may only become visible after cleaning. No leather or suede article is made up from one particular animal skin, but from various skins - which makes every leather or suede article unique with its own characteristics. In the cleaning process, normal grubby marks and perspiration stains on collars and cuffs are removed or improved upon…There is usually a loss of natural oil, and a slight loss of colour or dye…Anything glued sometimes becomes unglue and shoulder pads can become loose. In view of the fact that each article, whether leather or suede, incurrs its own individual set of possible problems, prices charged must vary accordingly.